The area's rich coal deposits made the steel industry possible here. 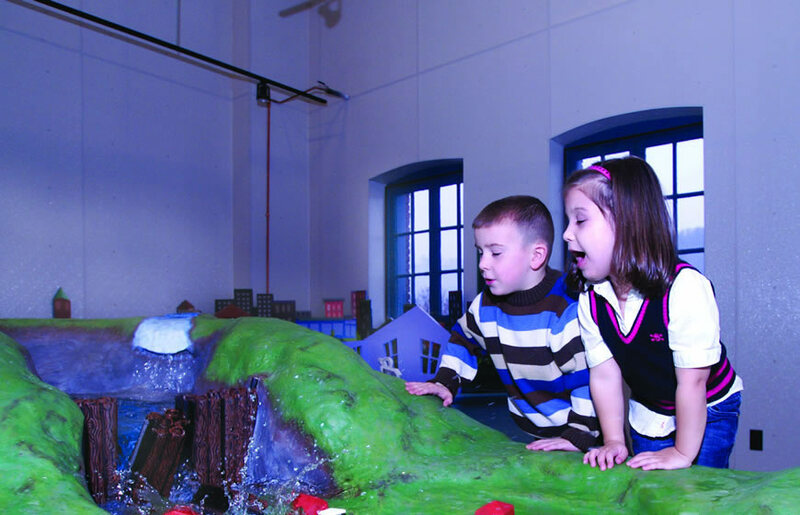 Johnstown is located in Cambria County, which is rich in coal resources. As early as the 1760s, white settlers in the Conemaugh Valley dug coal, which was used in the forges and blacksmith shops of the first villages of the 1790s and onward. A few small-scale iron foundries began operating by the 1840s, but they were operated with charcoal rather than coal. To produce two tons of iron, a small furnace needed the charcoal yield of an entire acre of woodland, so a typical furnace would consume about 150 acres of wood per year. A new, more effective fuel was introduced – coke, a form of coal refined into almost pure carbon. By the 1850s, iron made with charcoal accounted for 45% of the total manufactured in the U.S., down from almost 100% in 1840. By the end of the Civil War only 25% was made with charcoal. 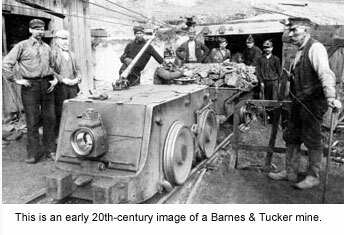 The coal industry in Cambria County gradually grew as charcoal was phased out, with the rise of the iron and steel industry in Johnstown and the founding of the Pennsylvania Canal and Allegheny Portage Railroad, which was completed in 1834. 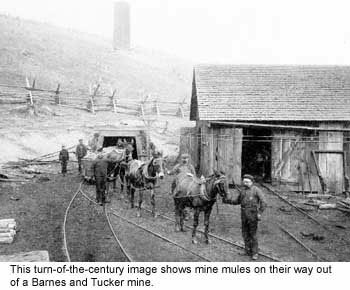 The earliest commercially operated coal mines in Cambria County include the Myers brothers mine (1845) and Samuel Lemon’s mine (1845), both near Summit; Matthew Adams’ mine near Summit Springs (ca. 1840s) and the Dysart Shaft (ca. 1840s). The first large-scale mining in Cambria County occurred in 1856, when the newly formed Cambria Iron Company opened the Rolling Mill Mine (see below for details on this company). By 1885, nearly two dozen mines were operating in Cambria County, producing a bit more than a million tons of coal — about one-fourth of that was mined by the Cambria Iron Company. Additional large-scale coal producers of the late 1800s include the C.A. Hughes & Company (1880), operating between Lilly and Cassandra; the Taylor & McCoy Coal & Coke Company (1881) near Gallitzin, which in addition to mining also constructed 240 coke ovens; and the Sonman Shaft Coal Company (1883), which was near Portage. 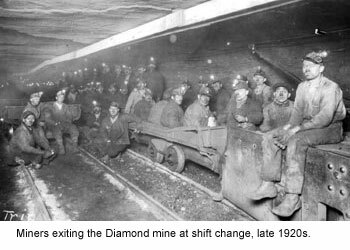 By 1901 there were 130 significant coal mines in the county. 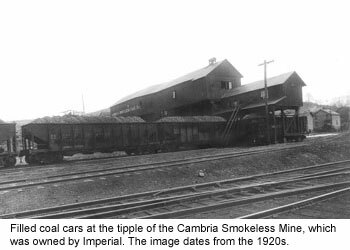 The 1910s and 1920s were the most active decades for Cambria County coal mining, producing over 16 million tons of coal annually (except for 1922, when a widespread miner strike reduced the amount to about 12.9 million tons). The Great Depression impacted the industry severely, however – many smaller operators went out of business. As the nation’s economy improved, surviving smaller companies tended to consolidate with a handful of larger companies. By 1941, only about 75 coal companies remained in the county, down from twice that in the early decades of the 20th century. Mining remained an important industry through the 1940s and 1950s, and the energy crisis of the late 1970s sparked a renewed interest in coal. But by the 1980s, however, coal mining had ceased to play an important role in the county’s economy. With the increase in other energy prices, coal is currently undergoing resurgence in the county. Below is a listing of some of the major coal companies that operated in Cambria County. Founded by English immigrant Thomas Barnes, who began mining in Clearfield County before purchasing coal lands in northwestern Cambria County in the early 1890s. Eventually it operated 11 mines in the vicinity of Barnesboro, its company town, until ceasing mining about 1985. Organized by brothers Charles and Edward Berwind and Judge Allison White, beginning with a mine in Clearfield County before opening additional mines in Cambria (the first was in Dunlo, followed by several in the Paint Creek Valley south of Johnstown), Somerset and Westmoreland Counties. The company town of Windber was established around 1898 just over the Cambria County line in Somerset County. The company operated several mines into the 1950s, and in 1962 was reorganized into the Berwind Company, a Philadelphia-based firm that manages the real estate holdings of the company. No longer engaged in mining, the firm still retains extensive mineral and surface rights in Cambria and Somerset Counties. A subsidiary of Bethlehem Steel, the corporation bought the mines belonging to Cambria Steel in 1923, and the Weaver coal properties in 1948. Later known as the BethEnergy Mines Corporation, this firm had active mines through the 1980s but declared bankruptcy in October 2001. Cambria Iron Company – The Cambria Iron Company and its successors, chiefly Bethlehem Steel, operated the most productive mines in Cambria County. The company mined coal here for more than a century. One of the most famous mines was the Rolling Mill Mine, which was located in Yoder (Westmont) Hill, near the convergence of the Little Conemaugh and Stoneycreek Rivers. One of the original portals to the Rolling Mill Mine is still visible near the Inclined Plane – through this portal coal was transported to the iron works on a company-built trestle. On July 10, 1902, the Rolling Mill Mine became the site of one of the deadliest accidents in U.S. mining history, when an explosion and resulting toxic gases killed 112 miners, mostly recent immigrants from Southern and Eastern Europe. 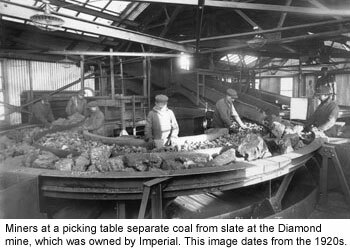 By the time the Rolling Mill Mine closed in 1931, it had yielded nearly 22.4 million tons of coal. Formed in 1909 by John Heisley Weaver and B. Dawson Coleman, this company first mined in Indiana County but moved into Cambria County with the acquisition of the Nanty-Glo Mining Company. The firm expanded their Cambria County operations, and formed several subsidiaries, including the Ebensburg Coal Company, the Heisley Coal Company, the Monroe Coal Mining Company, and the Cambria & Indiana Railroad (a shortline coal carrier). Coleman and Weaver dissolved their partnership in 1922, each retaining control over various portions of the company. 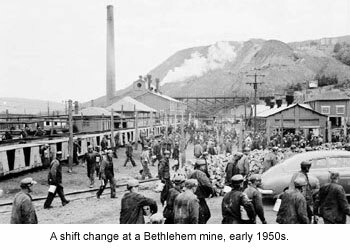 The Bethlehem Mines Corp. and the Eastern Associated Coal Corp. later bought much of the company’s holdings, some of which were operating late as the 1970s. Formed in 1912 by Harry A. Crichton and his brother Andrew with the purchase of coal lands in southern Cambria and northern Somerset Counties. The company leased fields to a variety of operators, notably the Beachley Coal Company, and expanded into West Virginia and Maryland. It acquired the Logan Coal Company in the 1940s, and the Beaver Run Mine in 1951, but by 1959 had divested itself of all Pennsylvania operations. Began as the Pennsylvania Coal & Coke Company in 1902 with Webster Coal & Coke controlling a 50 percent interest, and Mitchell & Associates and Berwind-White Coal Mining Company with 25 percent each. The economic crisis of 1907 hit the company hard, leading to a reorganization under the guidance of T.H. Watkins and the renaming of the corporation. In 1912, its first full year after the reorganization, the firm produced 3.5 million tons of coal from 30 mines, operated nearly 1,000 beehive coal ovens, and employed 3,000 people – more than twice the employees of the county’s next largest coal concern. The company continued to mine until the 1950s, when demand for Pennsylvania coal dropped sharply. Sources include: Gray Fitzsimons, editor, “Blair County and Cambria County, Pennsylvania: An Inventory of Historic Engineering and Industrial Sites,” published by the National Park Service for the America’s Industrial Heritage Project.